Education and Human Capital are building blocks for prosperous societies. The accumulation of human capital contributes to economic growth, making a case for the non-diminishing effect of education on rising per capita income levels. Furthermore, increased exposure to education allows people to lead more fulfilling lives. A better-educated population is better able to contribute to their society. 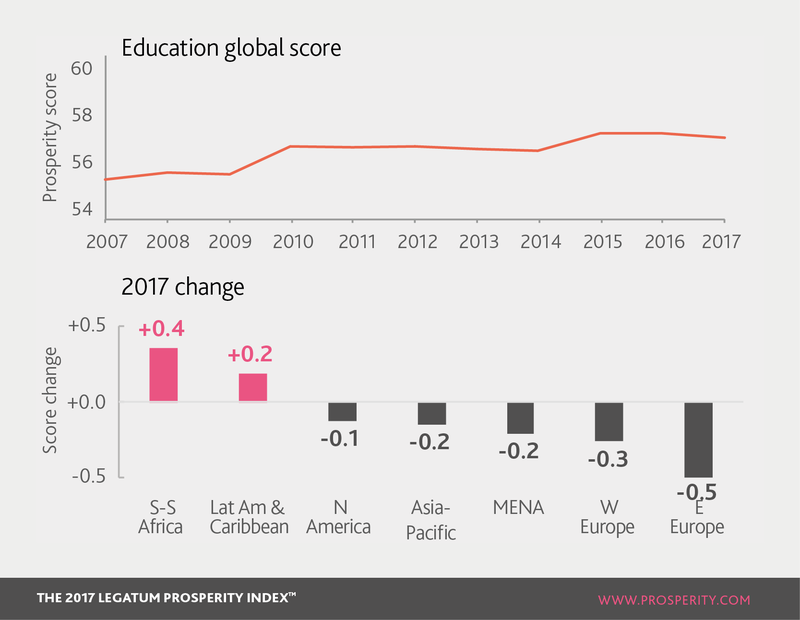 Education has improved in the world in the last ten years, in spite of a slight fall in 2017. The most notable improvement worldwide has been in adult literacy, which has increased by 3% since 2007. Sub-Saharan Africa improved the most in 2017, due not only to improving adult literacy, but also as a result of increasing numbers of girls enrolling in primary education. Furthermore, the region’s primary completion rate has also significantly improved in the last ten years. Access to Education examines how wide-ranging access to, and enrolment in, education is. This includes access across genders and the literacy rate amongst adults and youth. Bangladesh improved fastest in Asia-Pacific in this sub-pillar in 2017, following significant growth in the adult literacy rate among its citizens. Armenia improved significantly due to growth in girls/boys primary enrolment ratio. Despite ranking first in the world for in Education, Switzerland is 71st for this sub-pillar, because education is unevenly distributed among its citizens. Quality of Education measures the quality of education attained by citizens. This quality is reflected in the numbers achieving primary and secondary education, public perception of schooling and the international reputation of universities. Quality of education has increased considerably in Eastern Europe in the last ten years, with more years of secondary education per worker and a much better perception that children are learning at school. Ecuador’s citizens are increasingly satisfied with the quality of local schools and are more confident now that children are learning than ten years ago. Primary completion rate has significantly improved in Niger this year, adding to significant gains over the last decade. Human Capital of the Workforce measures the levels and skills in the workforce that encourage research and development. These are measured at secondary and tertiary level. Eastern Europe has the second best human capital score in the world among regions, behind North America. Peru has seen the largest decline in this sub-pillar in the last decade, primarily because of a fall in tertiary education per worker.